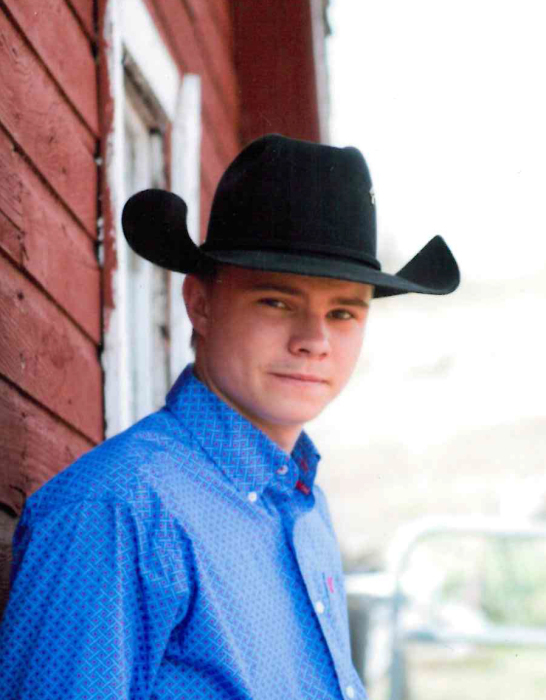 Koy Opdahl, 18, Zap, passed away November 24, 2018, in Bismarck, ND due to medical complications from Type 1 diabetes. Services will be held at 2:00 PM CST on Friday, November 30, 2018 at Golgotha Lutheran Church, Golden Valley, ND with Pastor Tom Olson officiating. Visitation will be held from 5:00 to 7:00 PM CST on Thursday at Barbot Funeral Home, Beulah and continue one hour prior to the service at the church. Koy was born December 20, 1999, in Bismarck to his parents Kevin and Jane (Landeis) Opdahl and raised in Zap, North Dakota. He graduated from Beulah High School and was enrolled in the Mechanical Maintenance Technology program at Bismarck State College. He worked part time at Menards and was a proud member of the Zap Volunteer Fire Department. Koy loved the cowboy way of life and rural North Dakota. This included red Angus cows, the local branding circuit, and the backroads. Despite the dirt and wore tires, he always swore the gravel was faster and the view was better. Koy’s favorite music was classic country and he was often found blasting his favorite, Brooks and Dunn. He said all he needed was KBMR radio, he didn’t even need FM. He felt most at home in the outdoors. He loved to hunt a variety of animals and fish in all kinds of weather. During the summertime, you would find him camping at the lake surrounded by loving friends around a bonfire. Koy loved working with his hands. This included helping his dad around the ranch, cooking with his mother, and working on derby cars with his friends. Koy was a loyal son, brother, grandson, nephew, cousin, and friend. He was stubborn, but had a soft spot for people and things he cared about especially his little corgi Tinkie. Koy was always there when people needed him whether it was a shoulder to cry on, a sincere hug, or any task asked of him. He was often described as an old soul; at times he seemed like he was 80 instead of 18. Koy also had a large group of friends and seemed to find company, new and old, in every place he wandered too. Plus, he was the best dance partner a girl could ask for. Koy was not the most vocal person, but he always had a joke to tell. A smirk meant a laugh and a person would be proud to get a small chuckle. Koy was extremely brave and fought a long battle with type 1 diabetes. He is survived by his parents, Kevin and Jane (Landeis) Opdahl of Zap; brother, Kane Opdahl of Watford City; twin sister, Kenzie Opdahl of Zap; maternal grandparents, Tom and Loretta Landeis of Mandan; Scott and Lorrie Berger and family of Mandan; Jay and Tammi Opdahl and family of Menoken; Pam Opdahl and family of Young America, MN; plus many friends who are considered family. He is preceded in death by his paternal grandparents, Lyle and Maxine Opdahl and his uncle, Jeff Opdahl. In lieu of flowers, memorials are preferred to the Juvenile Diabetes Research Foundation in memory of Koy.